Ms. Celiac Says...: Happy Cinco de Mayo!!! Today is Cinco de Mayo (the 5th of May) and in celebration of this holiday, I have a great recipe to share with you all. It is the recipe that was the Grand Prize Winner of Pamela's Greatest Gluten-Free Recipe Contest by Pamela's Products. 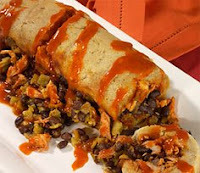 The recipe is for a Tamale-Style Stuffed Bread and was created by Ken H. from Texas. This recipe was made using Pamela's Gluten-Free Bread Mix. In a bowl, combine the flours. Mix chicken with 3/4 of one can of enchilada sauce. With a mixer beat together the lard and baking powder on medium speed, about 1 minute. Slowly add the combined flours as you continue beating. Gradually add 1/3 to 1/2 cup of room temperature broth until the dough becomes like a soft cake-like batter. Salt & pepper to taste. Line a 9-inch loaf pan with parchment paper, with plenty of overlap and extended edges. Remove paper and flatten on work surface. Spread dough in a 9-inch x 15-inch rectangle about 1/2-inch thick. Spread a layer of chicken on the dough, followed by the black beans and green chilies. Pour on remaining enchilada sauce. Roll up the dough jelly-roll fashion and lower gently, using the parchment paper, into the loaf pan. 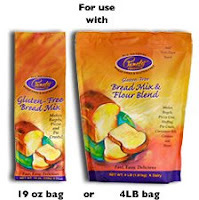 Trim and fold over the paper, then cover the loaf pan with foil and bake for 1 to 1-1/2 hours. When done, the loaf should feel firm in the center when pressed. If soft, return to oven for a few minutes longer. Let rest 10-15 minutes while you heat the remaining can of enchilada sauce. When done, turn loaf out onto a serving platter and gently remove the parchment paper. Slice into 1-inch thick rounds and pour a little sauce over them. Chef's Notes: The second time I made this dish I used a French bread pan, that has a curved bottom, instead of the loaf pan, and the shape was more like a giant tamale! The corn crust is so good you won't believe you made it. It was a little easier rolling it up and putting it into a round pan. For ease of rolling, I also used less sauce in the roll, and served more at table to compensate. Use plenty of parchment paper and the pan hardly gets messy, and it works just as well as corn husks. Remember, you can use any filling; I used my leftover turkey from Thanksgiving and it was a hit with the family. I have some Chile Colorado in my freezer that is just begging to be made into one of these crowd pleasing wonders. To find out more information about Pamela's Products and for other great recipes, please visit www.pamelasproducts.com. If you are interested in advertising on Ms. Celiac Says..., please kindly contact me at MsCeliacSays@gmail.com to request a copy of our media kit. Try Some Yummy Corn Muffins! Go Shopping at Ms. Celiac's Market! Have A Good Holiday Weekend! Remember To Spread Celiac Disease Awareness! I Love Celiac Awareness Month! I am not responsible for the gluten free content of any of the products on this website. One must choose gluten free cuisine based upon their own discretion. All statements made on this blog are solely opinions of the author. This work is licensed under a Creative Commons Attribution-No Derivative Works 3.0 Unported License.